Has BDL Affected Your Choices? 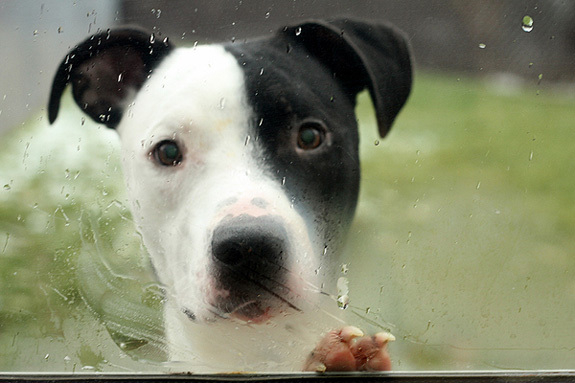 People with pit bulls will boycott places with BDL, change insurance companies (Go State Farm!) and go the extra mile to find a safe place to live. Thanks everyone for sharing! Yes. Even though my “pit” will be getting her Search and Rescue certificate, I am very careful about what states we visit. She’s never been to Colorado- Denver’s witch hunt scares the crap out of us. It definitely affects where I live and how I vote. I watch for BSL in my local politics and write my council member when I see it. And I won’t move to Prince Georges County in MD because pit bulls are banned there. Tommy Wells, my council member in DC, is pro BSL. I wrote him with a very well stated letter about how tying a dog constantly is much more responsible in causing dog bites, and his response to me was he just thought pit bulls were more dangerous. He lost my vote. I am originally from Ontario Canada. I am living in Texas now but my heart still wants to be in Ontario. Because of BDL that is not an option. I have to regularly travel 400-500 miles to agility trials, because most of the trials in the nearest state are held in a BSL location where I won’t go. When an “all” terrier club held its “all” terrier specialty at that location where NOT all terriers are welcome, those of us with ASTs/SBTs who had planned to go boycotted it. The club lost literally thousands of dollars in entry fees, and of course the local hotels/restaurants/gas stations didn’t get a dime from us either. We moved to a new state back in January and had to be very careful what town we moved to. BDL isn’t everywhere in Tennessee, but it does exist. Not to mention finding a home to rent that allowed our kids was hard. We are paying $150 extra a month. During the last local elections I emailed all the candidates and asked for their opinions on BDL. I voted for the ONLY one that was strictly against it. Absolutely. We live an hour outside of Denver. We’d love to visit for the restaurants & cultural opportunities, but refuse to spend a dime there while BDL is in place. Absolutely! I watch who/where discriminatory practices are and avoid which affects travel/vacations, employment, everything. But so worth it as I will never give up my girl and will not allow someone to tell me I cannot enjoy the love of a particular breed because of their ignorance. My husband is in the Army which makes it tough. Not living in base housing is no big deal. But we’ve already agreed he would have to take unaccompanied orders to any location with BDL. It does indeed. While BSL might not stop me from moving to a particular city, it will definitely affect the way I interact with that city. (I do not have pitties, though, so I suppose it is easier for me). 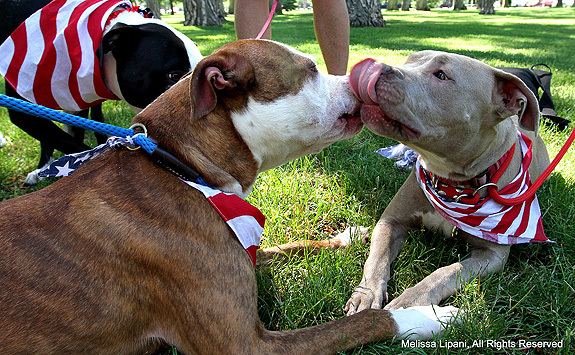 I’d definitely use my newfound citizenship to fight BSL wherever I am! I would not live anywhere I could not have my pit, who is a service dog. There were rumblings not long ago in the town I live about banning pits and I immediately decide to move, but there are so many pit and boxer owners here that the ban didn’t happen. BDL caused me to help organize a demonstration outside our city hall and to speak on behalf of our dogs to our city council. I was included in creating a dangerous dog ordinance for our city which did NOT allow for any sort of breed discrimination of any kind. Our sheriff (who is a friend of ours) is better educated now too (and has commented on what a nice dog I have). My dog has done amazing things for me and affected everything: from who I still talk to, to who I vote for in my city, to what products I spend my money on. No more Nike. If only my dog knew the power he has on me! Boy, I love him! I own a home in Hammond, IN where there are a lot of pit bull owners. There was a matter that the town wanted to push through to ban pitties; current owners could keep their pitties until they walked across Rainbow Bridge. There was such an outcry AGAINST it from homeowners and renters alike that in did not pass. I made myself much more aware politically of the leaders of the town. It affects us a lot. We are military and the military has banned pits, so we can no longer live on bases and finding a house for rent is impossible. We move frequently and I refuse to give up my dog – she’s our baby and one of our children. To me it’s like telling me I have to give up one of my children. BDL makes our lives difficult because of ignorance. Two of my four dogs are pits. 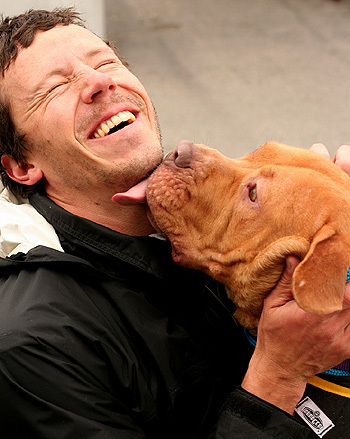 I had been using the same vet for over 15 years when I saved my first pit bull. I didn’t like the attitude I was given by the office manager I’d known for 15 years or the vet. So, I asked a friend where she took her pit boys, and I’ve been going there since. They are about 20% higher than my old vet, but my dogs love going! The office knows the dogs by name when we walk in. And our vet is on TV defending pits anytime the news in town is bashing pit bulls. She educates, answers questions, has training classes. And that’s worth the extra cost! It affects me every day. I live right outside of Prince Georges County, MD, and work in PG County a lot and my pit is always with me. It’s sad, because she’s a wonderful asset to her community. All of the pet-friendly business are pit friendly where I go, but one problem I encountered was when Sadie was a search dog. I always had to carry documentation that proved she was a search dog and that I didn’t live in PG County when we trained there. My husband is in the military and it always makes the task of finding a home harder. Every place we looked had breed restrictions. We finally had to fib about our dog’s breed to find a place to live. Unfortunately it influenced my decision when rescuing another dog. I really wanted a pittie, but since I take my dog everywhere (including work) I couldn’t risk having one because I live in an area with BDL. We have moved our homeowners, auto, life insurances and retirement and investments from Erie Insurance to State Farm because of BDL. I was contacted after the move and when asked why, so I explained that it was because of BDL and Erie’s dangerous breed list. The rep from the agency tried to talk me into leaving everything else but our homeowners with them. I explained that if they cannot insure my boy they would not have any of our business. While I will say that the price was a slight increase, the piece of mind is totally worth it! 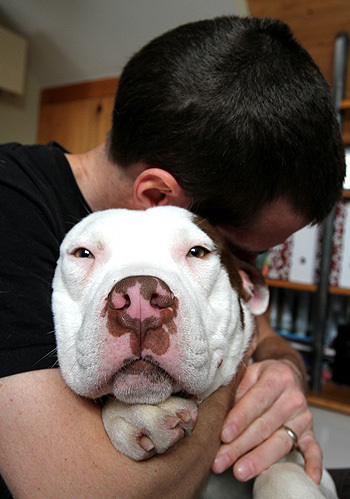 Yep –we boycott vacationing/investing money in Denver, (formerly) the entire state of Ohio, and any city that happens to have BSL. We plan to spend our money in pit-friendly places! BDL influences how I vote and where I spend my money for sure. It also makes me more aware of what my state’s legislature is up to. We switched our insurance- house plus all vehicles- to State Farm from a local agent who was sending surveys that included “breed of dog” questions. Liberty Mutual was OK with our pibble, but only “as long as she is always fully contained by a fence and never left off-leash” on our own 65 acres. No way! That’s why we love our local State Farm agent! We also love our vet, Scarborough Animal Hospital (ME), because they don’t discriminate. They love my girl. I avoid, boycott, or refuse to buy from any place or company with any type of negative views of bully breeds. There are plenty of other companies and places where I can spend my money. The number of bully supporters are growing each day. In time, these companies and places will feel the sting of lower profits. I can’t wait for that to happen!! I wanted to move to Denver, but I can’t because I love my dog. Instead of researching a location and saying “I’d like to live there.” I have to work backwards and find out what cities don’t have bans…and make my choice from there. Absolutely! I was at one time planning on visiting Denver. Now that I know how horribly the city treats its canine citizens, I have NO interest in going there, at all! After the upsetting ban in New York City prohibiting pit bulls, Rottweilers, Dobermans, and other large breed dogs from public housing, a few of us are investigating possible ways to reward/provide incentives for private property owners and management companies whose policies allow pets without restrictions on breed or size. As for private businesses, we have taken obedience classes at PetSmart and thanks to the trainer, now know we are welcome in Doggy Daycare and the PetHotel for boarding. 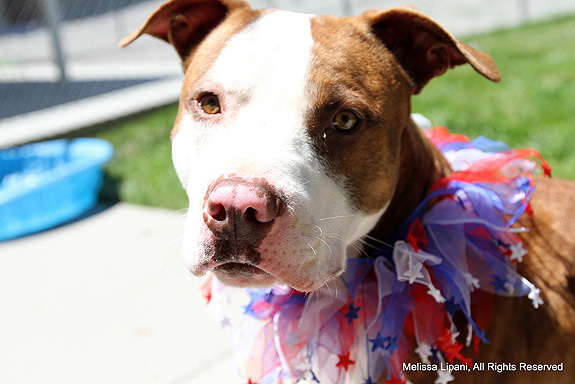 Although bully breeds are not permitted in Doggie Daycamp, I am still grateful for the options–so many boarding facilities/day care services in New York City do not permit bully breeds outright. My dogs aren’t pit bulls, but when I found out Geico discriminates, I changed my families insurance to State Farm. When Geico wanted to know why they lost my business, I told them that we refuse to support a company that discriminates. 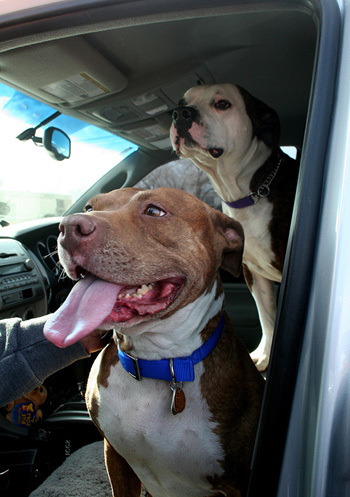 I won’t set foot in Prince Georges County because of the ban on pit bulls. We are also planning a trip to Northern Colorado in the fall, near where we used to live…there is one mountainous area that we wanted to visit but after looking at a map, we realized we’d have to drive through Denver, so we’ve decided we’ll have to skip that part of the trip…whether or not we bring our dogs or not, we don’t want to drop one penny in the affected areas. Breed Discriminatory Legislation is UN-AMERICAN! @woofslc We completely agree, it’s such a shame people with pit bulls and other banned dogs have to even think about this when traveling. @skreidle Thanks, that’s good to know. I was going to go to a school in Denver. When I told the school that I had Pit Bulls, they said I can not live on campus and would have to live outside Denver. They said they Euthanize healthy Pit Bulls on campus because of the ban against them. I will never give them my business. Along with Nike, I will not purchase. 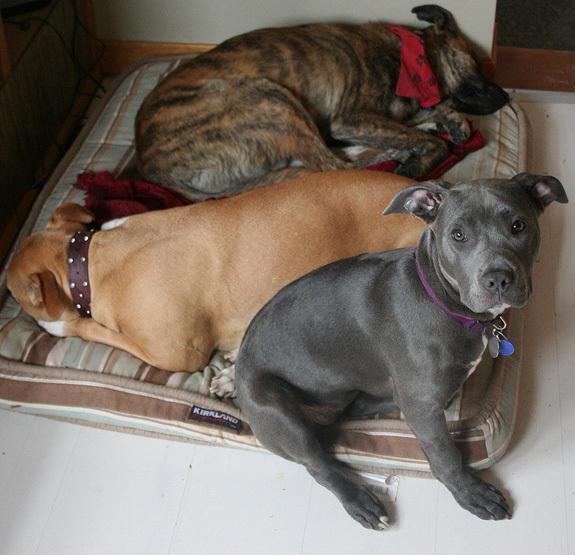 I also heard PetSmart banned bully breeds from the Doggie Daycare, and from any advertising. @AmberWolf Don’t hate on Petsmart just yet–the Petsmart where my wife works (and often brings our AmStaffs into) absolutely adores pit bulls and bully breeds. 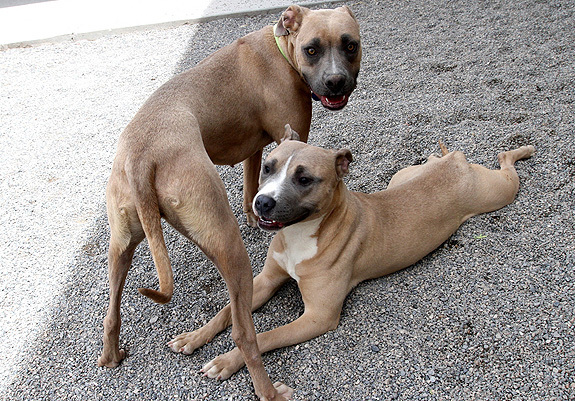 That is true about at least some of the doggy daycares–but I know plenty of pitty owners who wouldn’t even consider using a third-party playgroup like that, out of legitimate concern that their dog would be blamed by the other owners in case of an incident. As for advertising, I’ve never heard that before, and I’m not inclined to believe iy without proof. @AmberWolf We are sorry that people in Denver have to deal with BDL. From the comment below, we suppose that PetSmart experiences vary with different stores. Thanks for your comments. 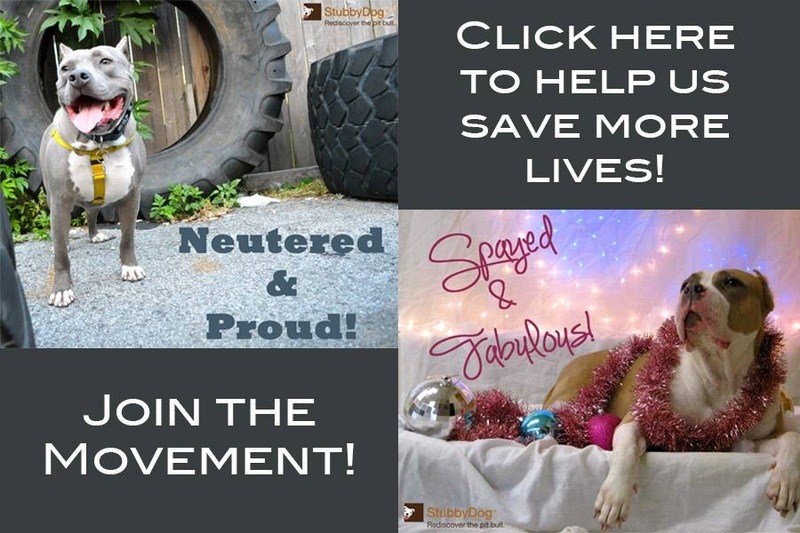 @StubbyDog @AmberWolf And PetSmart Charities sponsored a fantastic webinar on the pit bull problem that I participated in last week (the speaker was from the National Canine Research Council). @skreidle That’s exactly how I feel; he is very well-socialized but if given a choice, he (and I) prefer individual play with a single handler. We are taking the Tricks class next! @skreidle That’s exactly how I feel; he is very well-socialized (I’ve been taking him to the dog park and we are fostering a 9-week-old pit bull puppy right now), but if given a choice, he (and I) prefer individual play with an experienced handler when I am not around to monitor his behavior. We are taking the Tricks class next! @skreidle That’s exactly how I feel; he is very well-socialized (I’ve been taking him to the dog park since he was four months old and we are fostering a 9-week-old pit bull puppy right now), but if given a choice, he (and I) prefer individual play with an experienced handler when I am not around to monitor his behavior…We are taking the Tricks class next! @tdotcopeland The dog in that story is a former StubbyDog of the Week, so we were really happy to share his family’s story with AFF and our fans!